In this project we show you how to treat rising damp using a range of DIY rising damp treatments. We'll take you through the different causes and signs of rising damp as well as how to treat each of these with different rising damp solutions. Rising damp problems often occur as a result of not having a Damp Proof Course installed or having a Damp Proof Course that is faulty due to age or inadequate installation. A Damp Proof Course is a waterproof layer in your wall (or both walls if you have a cavity wall), ideally about six inches from the outside ground on your external wall and under your raised timber floor or near your concrete floor on your internal wall (so both DPC’s are on the same level). This layer repels water – a variety of different DPC’s are available and will be discussed in this project. You may be experiencing rising damp even if your Damp Proof Course is functioning well –in this case the DPC may be breached – that is, there may be something attached to your walls that is allowing water to travel around the Damp Proof Course and continue moving upwards. It may be that there is an area of ground next to your external wall that is higher than your DPC, or there is an outside structure (such as steps) which is attached above the DPC, allowing water to travel up through this and cross to the wall over the DPC. There are several other ways your DPC might be bridged. Your internal plaster may be directly connected to a solid floor at the bottom on your internal wall. Your cavity wall may also have debris inside of it, whether it is leftover building materials or something else. If this debris reaches above the DPC’s then this can create another bridge for moisture to travel from the ground over the DPC and up your wall as rising damp. Remember that your damp problem may not necessarily be caused by rising damp – there may be another source of water that you are not aware of. A telltale sign that your damp is not rising damp is if the damp patches are higher up than 1 metre on your wall and are unevenly distributed, in which case you may be suffering from penetrating dampness instead. To be sure that rising damp is the issue you’re facing, take a look at our other project page Damp Diagnosing and Analysing project page. 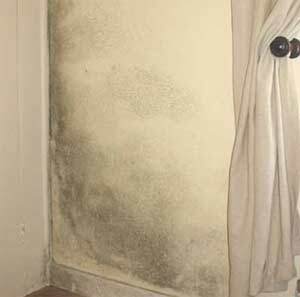 How Can I Find Out What is Causing my Rising Damp? If, at any point during the diagnosis process you feel that you need some additional insight or advice please call Property Repair Systems on 01626 336180. They will be able to offer you assistance free of charge. You should first check that you have a Damp Proof Course – this will usually be visible outside your house as a line 6 inches above the ground. If you do have a DPC, check that there are no structures bridging your DPC – examples include higher outside ground or outside steps that are higher than your DPC and internal plaster that directly meets a solid floor. The rising damp could also be coming in from a neighbour’s property if they don’t have a DPC or their DPC is higher up than yours, allowing the damp to travel around your DPC. As mentioned earlier, your DPC may also be bridged internally. 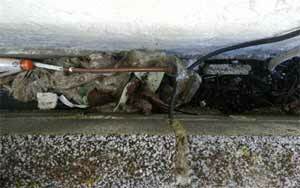 This happens when your cavity wall becomes filled with debris, which can happen during the building of your house. This can reach higher than the level of the DPC, allowing water to travel up it and over the DPC, then it can travel, via the bridging material, through the wall to the inside. 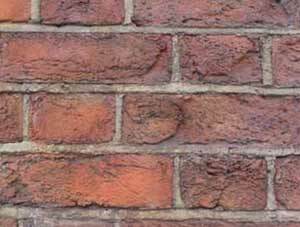 You can check for this by removing some of the bricks on your external wall (don’t remove more than two bricks without consulting a tradesman or surveyor). Using a phone with a light or a camera, take a look around the cavity. If there is debris there, you can take this out by hand if you can reach it (use sturdy gloves to avoid injuring yourself on sharp objects) and use a bar to drag any out of reach objects closer to you. To get smaller bits and dust out, use an old vacuum cleaner. Once the cavity area you have access to is clear, replace your bricks. As with all projects on DIY Doctor, we don ’t recommend that you deal with the effects of a problem without first tackling the cause. You need to identify the cause, deal with it and then carry out the necessary repairs to deal with the effects. Carrying out a quick-fix for rising damp, (e.g. repointing or painting over the damp) will just make the job more expensive in the long term and will mean you need to do the job all over again at a later date. 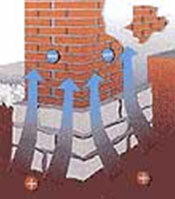 If you’ve established that your rising damp is caused by a blocked cavity wall, unblock your cavity as described in the section above. If you know that your Damp Proof Course is bridged in another way, such as by high outside ground, try to remove or adjust whatever’s causing the bridge so that it only reaches below the DPC, i.e. digging a trench that’s six inches deep by your house if your Damp Proof Course is buried in the ground currently. In this case, make sure that water doesn’t pool in the ditch you’ve created, as this will cause its own damp problems. If you can’t remove the object breaching your DPC or you have an absent or faulty DPC , the best way of treating your rising damp is to damp proof – in other words, to install a new Damp Proof Course in your walls. This can be the first DPC your house has had or installing one above your existing one – if you have a structure breaching your DPC that you can’t move, you’ll need to install a new DPC above the structure instead. You can try to ‘top up’ an existing damp proof course but this isn’t advised as you need a continuous waterproof layer without breaks and this fix doesn’t guarantee that, meaning that you could quite possibly be wasting your time. 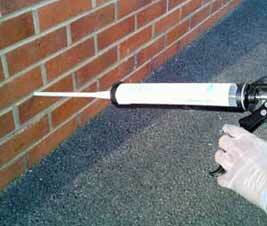 A damp proof course is a waterproof barrier that spans the width and length of your wall. It stops water from the ground rising up through the wall through capillary action. The DPC needs to be installed at least six inches above ground level according to British Standard 6576 and Building Regulations also state it should be at this height. DPC’s come in a variety of different forms, from sheet materials such as plastic through to chemical formulations. 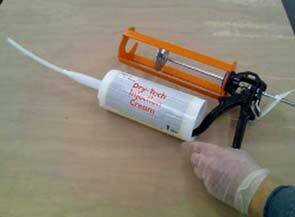 The easiest method for DIYers is to use a chemical formulation DPC – we use the DPC cream made by PRS as we have found it to give reliable results. Whichever method you choose to use, you will need to install your DPC on both your internal and external walls if you have a cavity wall. 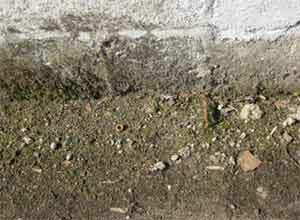 The level at which the DPC is installed needs to be at least 6 inches above the level of your outside ground and at the same level on your inside wall– if your outside ground level is higher than your internal floor level, you need to make a trench in your ground by your external wall deep enough that your DPC can be level with your concrete floor or under your raised timber floor inside. If this is not possible, you will need to install the internal DPC above your floor level so that it is level with the outside DPC, which means that you will need to tank (waterproof) your internal wall below the DPC line to minimise any water ingress in that area. 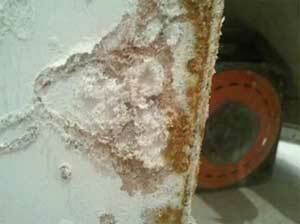 More information on solving damp issues below your DPC can be found here. When you come to install your DPC, however your walls are configured, you will need to remove any skirting boards and the plaster on your internal walls up from your floor level to where you want to install your DPC. 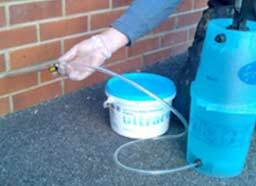 The easiest and most practical DIY rising damp treatment to use in your DPC installation is, as we’ve mentioned, the chemical water repellent DPC available as a liquid, cream, gel or paste. Old versions of this system used wires that were prone to corrosion, but the new Lectros Active System uses titanium wire linked to a transformer and a mains supplied control unit. The wire is run around the walls like a ring main. Again, holes are drilled in the wall, either externally, internally or both. The wire is bent into loops to create anodes, and these loops are inserted into the holes. 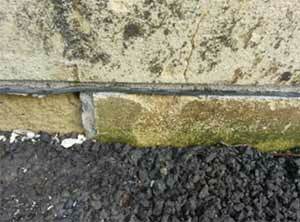 The wire is then hidden in raked out mortar joints or specially carved out ‘chases’ and the wire is earthed. The wire is secured in the holes and the chases with a special mortar that increases the conductivity of the system. When the system is switched on, electricity passes through the transformer and the anodes and to earth, which sets up an electric field that repels water. This technique again requires expensive and large drilling equipment and so is only really economical for tradesmen. Now you’ve sorted the cause of your rising damp, you can move on to tackling any repairs you need to carry out on any parts of your home’s interior that have been affected by the damp. If your plaster is stained but sound, you may be able to redecorate without replastering, but you should check that the plaster is dry (or leave it to dry) before doing so and check that the walls don’t have any mould or salt buildup caused by the damp. 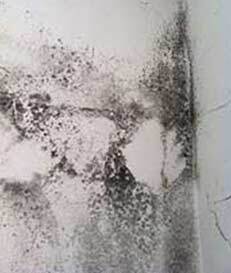 The mould will present as black spots – if the plaster is still sound you can treat it with Anti-Mould Cleaner and then an Anti-Mould paint or add an Anti-Mould Additive to your wallpaper paste when you redecorate. If the mould or damp has stained your wall you can paint the surface with a stain blocking primer before redecorating to minimise this – we can recommend the Stain Blocking Primer Paint made by PRS. Salts build up on the wall as a result of the salts in the brick being drawn out of them by the damp and into the plaster, where they form fluffy white deposits. As long as the ‘salts’ haven’t structurally damaged the plaster too much you can just treat your walls for them using a salt neutraliser (typically we use the salt neutraliser available from Property Repair Systems) before redecorating. Just paint the salt neutraliser on and wait for it to dry before redecorating. 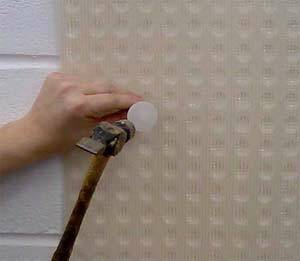 If the plaster isn’t sound any more, strip off your plaster to 30cm above the highest damp point on the wall – use the back of your hand or a damp meter to determine this. When you’ve stripped your plaster off you have three options for replastering to prevent future salt and mould appearances– you can either brush the wall down, apply your Anti-Mould cleaner or Salt Neutraliser and then replaster, use your salt neutraliser and anti-mould cleaner and fit a mesh membrane before replastering, or you can add a breathable, waterproof render to your wall before replastering. You also have different options for your salt neutraliser – you can either paint it directly onto the wall, replaster using a plaster that contains salt neutraliser already or add your salt neutraliser to your plaster mix. 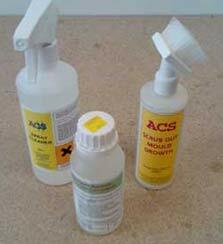 Look for a neutraliser that you can apply in the way you want to and always follow the manufacturer’s instructions. You can find more information on how to fit a mesh membrane to your wall in our How to Install a Mesh Membrane DIY Project. To add the render, brush any residue off the walls, and fill any holes and cracks using 4:1 washed, sharp plastering sand and cement. If your walls are made from a non-porous material such as granite you’ll need an adhesive like BondAcryl concentrate to stick the render to the wall. Dampen the walls a little and apply your render at a half-inch thickness maximum – your render should be 3:1 washed, sharp plastering sand and fresh Portland cement mixed with 1:40 Renderproof waterproofer (Renderproof is available from PRS here) and water. 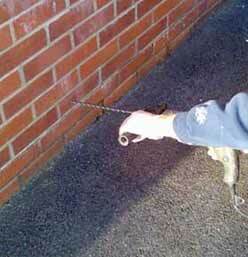 Make plenty of scratches in the damp render surface using a trowel. When this layer is solid without being dry, add a second layer in exactly the same way. You can add multiple layers until you have reached the thickness you want. While it’s damp add a skim coat of Board-Finish or Multi-Finish plaster – don’t add water or polish it. Wait a month to decorate with a thin layer of breathable (not vinyl) emulsion if desired. In about three months’ time you should be able to repaint or wallpaper the wall. You can confirm that a render or other waterproofing product you are buying is of good quality by checking that it meets the British Board of Agrément’s standards over on their website. 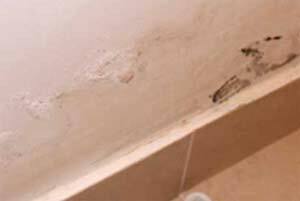 If you need any further help with your rising damp problems please contact Property Repair Systems on 01626 336180. We have worked with them on a number of projects over the years and they are specialist in this subject.